We were first introduced to Pete the Cat at library story time. Pete is a cool cat that doesn’t let anything bother him. In situations when most people would cry, Pete just keeps on singing his song and going along. Pete has an incredible attitude in the face of diversity, and I that’s something that I want JW to learn to have too. We’ve only been exposed to two Pete the Cat books so far, but both have songs and there is a moral of the story at the end of the book. After hearing a Pete the Cat book at story time, we decided to check out “Pete the Cat: I love my White Shoes” from the library. I noticed that the cover of the book lists a website where you can go to download a free song that goes along with the book. So, after reading the book a few times, I queued up the song on my laptop and followed along with the book as JW sang and danced to the song. 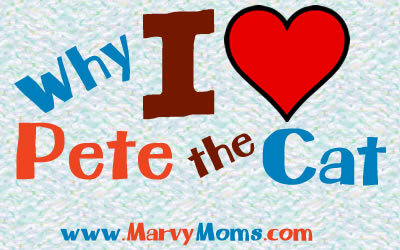 We’ve since done the same thing with “Pete the Cat and his Four Groovy Buttons.” Go to www.harpercollinschildrens.com/petethecat to download five free songs, watch videos, and even print out a game to play. 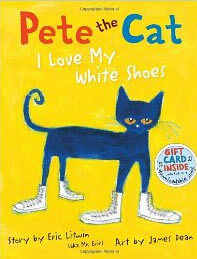 In the “Pete the Cat: I Love My White Shoes”, kids learn that we can get dirty and that things change when we least expect them to, but if we have the right attitude we can keep going along, singing our song, and it’s all good. In “Pete the Cat and His Four Groovy Buttons”, kids learn that things may seem to be falling apart, but we can make it through by being grateful for all that we do have. And in the end, we may have nothing external to hold onto, but we still have ourselves, and we can keep singing our song. Circumstances are temporary, so it’s our attitude about them that counts. Can’t wait to read more Pete the Cat books with JW!